Are we seeing the disability or the potential? 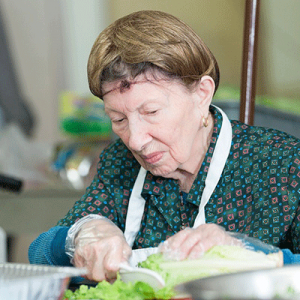 Would you believe that residents with diseases such as Alzheimer’s, stroke, Parkinson’s, MS, or vision impairment are preparing meals and feed the homeless throughout California? Having been a nursing home administrator for almost 20 years, I have seen firsthand the depression and apathy so prevalent in our communities. We have all been struggling to find the “magic pill” that will solve these problems. The truth is, there is no one magic pill. But I believe there are some holes we have yet to find and fill. One of them is the transformative power of selfless service. We have made tremendous strides in our abilities as caregivers and the level of care we provide. Resident-centered care and dramatic advances in our environments have made traditional nursing homes almost unrecognizable. However, in the end, if we have the world’s best caregivers, provide unlimited choices, and state of the art or homelike accommodations, is it possible people could still feel useless for the rest of their lives? If you received the best of the best that long-term care has to offer, but no one needed you anymore, might you still feel like a burden? Although superior care, choices, and environment are the foundation of what we do, is that enough? Being a grateful “care receiver” does not necessarily give someone meaning and purpose in their life. Further, it does not provide a reason to get out of bed. At Rockport, we believe that life is more than receiving. Life is more than choice and entertainment. Life is being needed — having purpose, having responsibility, being able to give, being able to serve. We are absolutely convinced that residents can give in a productive, meaningful way if given the opportunity. This belief led to the inception of a “A Heart to Serve.” Currently 60 of our 75 communities are engaged in this great experiment. At the foundation of this program is the belief that anyone with “a heart to serve,” can serve. Residents with Alzheimer’s Disease in long-term care have been helping with simple tasks for years. 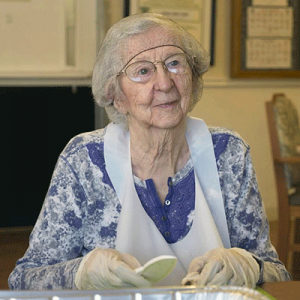 They fold napkins and towels, clean up after meals and always seem ready to lend a hand. If they can perform these tasks, and have this innate desire to help, they can serve people in need in their community. Rockport has developed a program that allows hundreds of people with Alzheimer’s Disease to use plastic chef knives and other tools to safely prepare food. They chop vegetables to make a salad, slice fruit, and make chocolate chip cookies to feed men, women and children at local homeless shelters and soup kitchens. And then these same residents go out to shelters and scoop the food onto the plates of grateful members of the community. Dozens of stroke survivors that have left sided neglect are using their right arm to turn the handle of the cheese grater while another resident with right sided neglect feeds the cheese in and presses down — teaming up to help their community. Others with Parkinson’s Disease are chopping chicken and turkey for chef salads with safety knives. People who experience tremors are still capable of serving others. With adaptive equipment that supports their desire to do useful work, it is amazing to see what people can do. Thinking differently about the value each person brings to our community often requires some shifts in our own habits. Sometimes, as caregivers, our need to help is so strong that we don’t see the harm helping can do. I watched one of our residents with a CVA work for five minutes to cut a slice of cantaloupe. It came out looking more like the state of Texas than a traditional slice – but doubtless just as delicious! Watching her determination filled me up. She was focused and ready to start working on the next slice. A smile was dawning on her face. A well-meaning activity aide came over to her and said, “Oh look at that – let me help” and quickly sliced off the rough edges. I could see the life drain right out of her. She immediately started backing away from the table and struggled to roll her wheelchair out of the dining room — probably with feelings of defeat and embarrassment. From joy back to depression in a flash. Residents are the stars of “A Heart to Serve.” Caregivers are the stagehands. The power behind the desire to help others should never be underestimated. Miraculous things happen while the residents are in charge and we are their assistants. We can do our part by repositioning a pan, finding a better scoop, adjusting the height of the table … And then we can step back into the shadows and watch what we didn’t think possible. This isn’t about us. It’s about people finding their way back to a valuable place in our society, back to being needed, back to self worth … finding a reason to get out of bed. We are just beginning to understand the possibilities and the role of selfless service in the lives of people in long-term care — and the potential in each of them to contribute to our world in a meaningful way.